351W stroked to 425. Ported Brodix heads, 620 lift cam. Mallory laptop programmable ignition system. Dynoed 405 rwhp and 428 rwtq with a 600 cfm carb. I have an 800 cfm Edelbrock AVS I\’ll throw in, should be worth 15-20 hp. New mufflers were installed a few months ago and the pipes recoated. The passenger exhaust pipe had a plastic bag melt on it while I was driving, going to get it recoated soon. Power steering, IRS with 3.08 gears. 5 speed. 17\” wheels with Nitto NT01 tires on them. Tan leather interior. 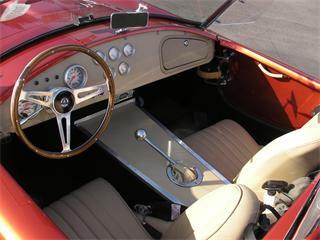 The seats are MKIII and I had an upholstery shop cover them in tan Jaguar leather. Hidden Audio stereo system. Radio only but I think you can connect a CD changer to it. 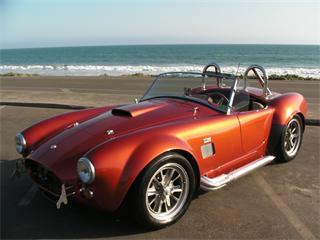 The paint is prowler orange and gets compliments everywhere I go. 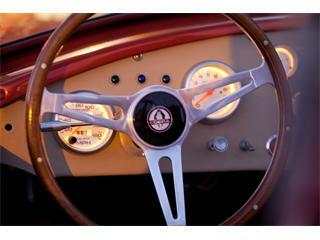 The car is currently located in Los Angeles and is titled in Tennessee as a 1965. 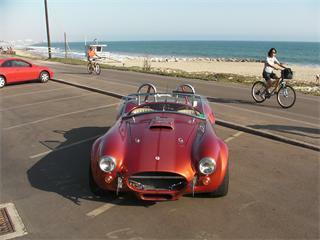 The car was registered previously in California with no SB100 issues because it is titled as a 1965. The metal bar in the front can be removed. I had a laser jammer mounted on it before that I\’ve removed. I\’m not in a huge rush to sell. I\’m the second owner and paid $36,500 two years ago and I\’ve sunk about $10k in it since then. $35k is a fair price plus I\’ll throw in a Valentine 1 Radar detector that is already hard wired.